Readers on BookBub can follow their favorite authors to find out when they have a deal or new release available. 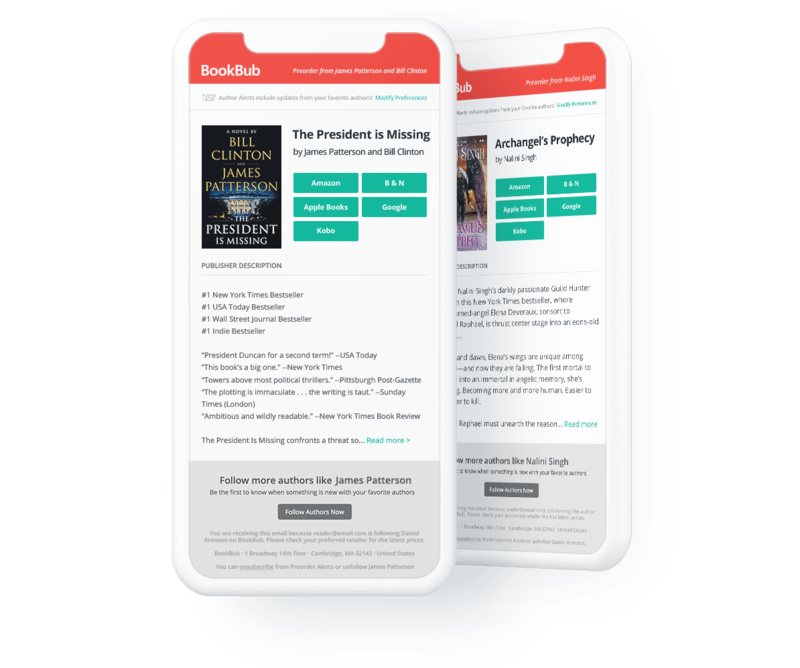 Preorder Alerts let you email these loyal fans when an author has a book available for preorder, helping to ensure your launch week is as successful as possible. Why send a Preorder Alert? Preorder Alerts are sent only to readers who chose to follow the author on BookBub, ensuring you’re reaching an engaged audience of core fans. Partners have seen significant sales across multiple preorder price points, from $0.99 to $14.99. Gaining pre-release momentum and informing fans about upcoming books has helped many partners launch bestsellers. The timing of your Preorder Alert is entirely up to you — choose to drive your book up retailer charts early, or save it for a last push closer to release day. "I can always count on a BookBub Preorder Alert to give me a good boost before the big day. By targeting those who have already selected to follow me, I know I'm accessing a captive audience that has been shown to not only like a good deal, but to also buy full-priced books!" Submit your upcoming release for a Preorder Alert on the date of your choice via the Partner Dashboard. We’ll review the preorder to ensure it meets our requirements. Once confirmed, you pay for the campaign. Make sure the preorder is available on the retailers you want included in your Alert. Your Preorder Alert will be emailed to the author’s followers on your scheduled date!